Starter Set Instacoll Gilding | Instacoll | Gold & Gilding Materials | Kremer Pigments Inc. Contents: 5 sheets of Gold Leaf Rosenoble Double Gold, 80 x 80 mm, 50 ml Base, 50 ml Activator, 1 Toray brush, tissue, processing instructions. 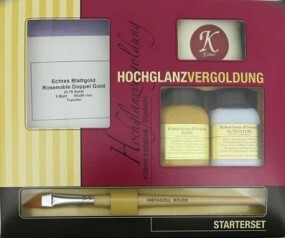 Customer evaluation for "Starter Set Instacoll Gilding"